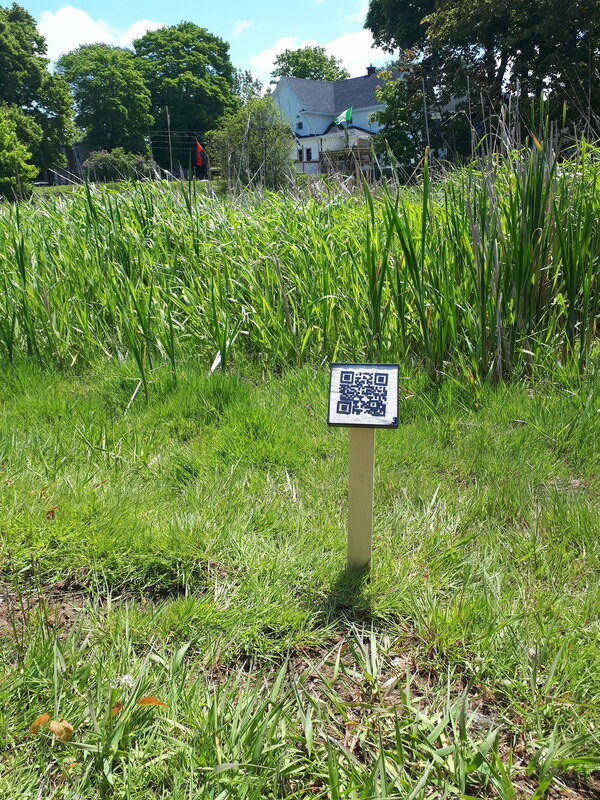 A digital walk through Miner’s Marsh exploring personal narratives and alternative histories, while encouraging pedagogical discourses and personal responsibilities. 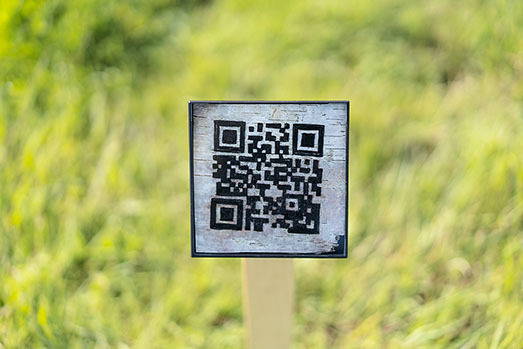 To participate in this walk a QR code reader is needed, you can download one from any app store. Installed for Uncommon Common Art 2018. Notice where you are standing, feel the grass, roots, and soil on which your feet rest. What happens when you take a moment to think about the land, this land, right here, right now? Its history long and complicated. This land is unceded, which means that it was never given away by its first peoples. Instead, this land is protected by a series of Peace and Friendship Treaties made between the Mi’kmaq people and the British crown beginning in 1725. These treaties suggest that later arrivants are guests of Mi’kma’ki, not rightful owners of the land. Do you feel a connection with this history? With any of its people? Do you feel a connection with the land itself? What does that connection feel like? What does that connection look like? Can you imagine it in your minds eye? Site is meant to inspire viewer-participants to think about and critically engage with the land where they are standing and its history. As you walk through the various panels of this art installation, let yourself take time to reflect on your own story and history in relationship to this land. How did you come to be here? What moments in history brought you here? Colonial settlers have referred to this river as the Cornwallis River, named after Governor Edward Cornwallis, a British military officer who founded Halifax as a military garrison in 1749. Cornwallis was infamous for issuing bounties on the scalps of Mi’kmaq people, including women and children. Here, as elsewhere in the province, and across the country, when Indigenous land was appropriated, Indigenous place names were often erased and replaced, many with names like Cornwallis that signify, not heroism for Indigenous people, but rather terrible histories of genocidal violence and oppressive behaviour. (Recently steps have been taken to rename the river and a host of other sites bearing Corwallis’ name again; you can read about this process from an Indigenous point of view here). This river is known to Mi’kmaq peoples as Jijuktu’kwejk, or Chijekwtook, which is pronounced “gee gee WOK tok”. Jijuktu’kwejk has been a highway to travel, a space to gather nourishment, and an important gift from the Creator since time immemorial. All rivers are part of a large system of waterways that help sustain life on Mother Earth. Indigenous peoples have always understood the importance of water and that is should be protected and honoured. This river is important to both Indigenous and settler histories. The town of Kentville’s website states, “While the Cornwallis River had a minor role in a relatively small region of Canada, it was of major importance to the first settlers and the people that followed them. Kentville owes its location to the fording place on the Cornwallis River.” That history owes everything to the Mi’kmaq peoples who welcomed newcomers and agreed to establish an ongoing reciprocal relationship within the framework of the Treaties of Peace and Friendship (1725-1761). Would Indigenous names and acts of renaming make it more apparent that we are standing on Indigenous land? Miner’s Marsh is now a protected site, which means it is protected for its ecological integrity, as well as providing a space for recreation and education. Before settlers occupied this land a relationship protected the land rather than a piece of paper. Treaties don’t only exist between nation states. Indigenous peoples have had treaties with Mother Earth, living in balances with the other earth beings (plants, animals, rocks, ect.) since time immemorial. It is understood that humans and Mother Earth live in a reciprocal relationship; you can see this in song, dance, and ceremony of the Indigenous nations across Turtle Island. This land is in Mi’kma’ki, which is protected by the Peace and Friendship Treaties of 1725, 1749, 1752, and 1760-61. Signed by representatives of the Mi’kmaq people and the British crown, these treaties recognize and formalize terms for an ongoing relationship between settlers and Indigenous peoples of and on this land. Because they have never been undone or superceded, these treaties are still alive and need to be respected. What does respect for such a treaty look like? First, it might be important to figure out just what a treaty is: when we should all take some time to read and discuss the texts of these treaties. Because such treaties concern all of us, every citizen of this country should become familiar with the territorial treaties that govern the areas where they live and play. If we understand that these treaties are binding and continual, then we can each and all understand a little bit more about what our rights and responsibilities under these treaties are. How can you be a good ally? To be a good ally it’s important to first listen and to learn. To ask questions. To engage in conversations. You can also join an Indigenous cause, ask local Indigenous communities what you can do to help, and continue your education by learning more about Indigenous knowledge and ways of thinking. Poet and educator Rebecca Thomas explains from a Mi’kmaq perspective what “two-eyes seeing” is. If you want to know more about that, watch her video! Yes, there’s a lot to learn if we are going to do the necessary work of relationship building and reconciliation together, but that’s also exciting. One way to be a good ally in a settler-colonial state like Canada or the USA is to (re)learn our colonial histories from the bottom up, through the eyes and testimonies not just of the winners and those in power, but, as well, through an Indigenous/Mi’kmaq lens. Canada is build upon colonial history, there is no denying that, but we work together to create a more inclusive, decolonized and respectful future. The first step is getting to know all aspects of our history better. If you’re a settler, you might ask yourself how you and/or your ancestors have benefited from this colonial history. What did you arrive with? What do you get to keep? What feels as if it is yours now? Is it? What do you fear? Why? By asking such questions, you begin actively to engage in a process of thinking that will help lead to decolonization and reconciliation.